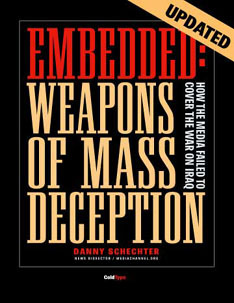 Join our mailing list now and and we'll give you our special gift to ColdType subscribers, a FREE copy of Danny Schechter's 300-page e-book, Embedded: Weapons Of Mass Deception, which normally costs $US15 to download. How do you subscribe? Easy. Just send an e-mail to editor@coldtype.net (Type SUBSCRIBE in the message) and we'll tell you how to download Embedded: Weapons Of Mass Deception.